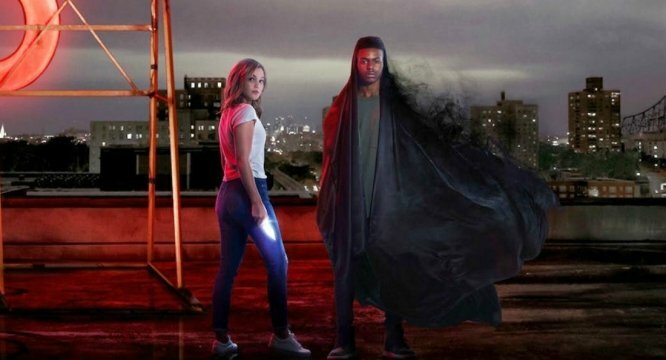 Olivia Holt (Tandy Bowen) and Aubrey Joseph (Tyrone Johnson) will become Marvel’s Cloak & Dagger when the highly anticipated coming-of-age superhero story premieres on Freeform on June 7th at 8pm ET. Though the titular heroes may not be A-listers like Iron Man, Captain America and/or Thor, there’s a good deal of buzz surrounding their upcoming small screen debut, as fans get ready for what looks to be another enjoyable slice of Marvel television. Bursting with young romance and teenage angst, the live-action adaptation comes to us courtesy of showrunner Joe Pokaski (Underground, Heroes), who looks to tell the story of Tandy (Dagger) and Tyrone (Cloak), as they each struggle to understand their superhuman abilities and how to keep them under control. But as with all new series from the House of Ideas, the one question that’s repeatedly come up ever since the project was first announced is will it ever crossover with any other Marvel shows? Producer Jeph Loeb was on hand to answer that this past week at WonderCon, and while he refused to give a firm answer, he also didn’t rule anything out. Are there opportunities because now The Runaways also live in that same kind of world? It certainly makes much more sense to me, but we’ll see what happens. As we often say to everyone — and it was certainly a much more easy thing for people to understand with The Defenders — is that we like people to get to know the characters in their first season. We don’t want it to become ‘Oh look who stopped by!” in order for you to watch the show. It has to be organic to the storytelling that we’re doing. We don’t ever want it to feel like ‘Oh look, Foggy Nelson just got off the bus! Great!’ We want to make sure that if that’s going to happen, that if we share, that it’s appropriate for the story. It’s Marvel. So, it’s all connected. What Loeb says makes perfect sense and is pretty much what we always hear whenever fans ask about potential crossovers between the studio’s shows. Of course it’s possible, but Marvel wants to ensure that Cloak & Dagger can stand on its own two feet first before they start adding in other characters, like say Daredevil, or Jessica Jones. Or even, as Loeb mentions, the Runaways – who’d really be the best fit. Also starring Andrea Roth, Gloria Reuben, Miles Mussenden, Carl Lundstedt, James Saito and J.D. Evermore, Cloak & Dagger‘s first season will premiere with a two-hour episode via Freeform on June 7th, with Gina Prince-Bythewood (Love & Basketball) helming the pilot.